Starting with the Solar Type 6512-106R Feed-Thru Capacitor, Solar Electronics has a series of 10 μF feed-thru capacitors which are specially designed to be used in RFI/EMI test setups such as MIL-STD-461A/462A. Many other specifications, such as RTCA DO-160G, now call for their use. In this application the capacitor provides a low RF impedance across the power source so that EMI currents produced by the equipment under test can be accurately measured with a current probe. 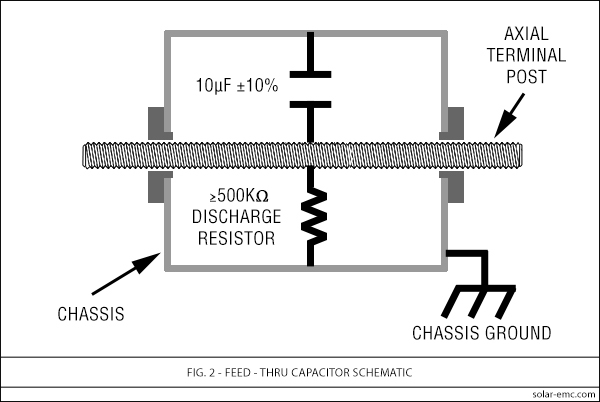 The feed-thru capacitor is used for added filtering in conjunction with line impedance stabilization networks. 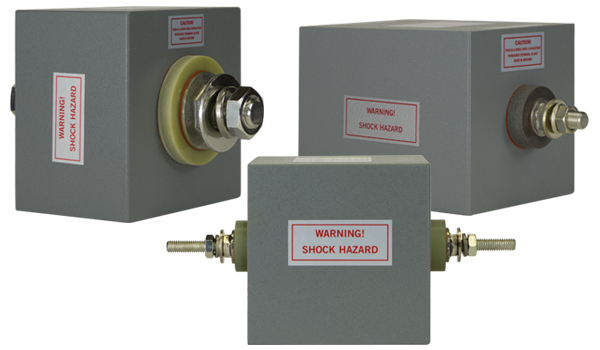 The 10 µF feed-thru capacitor can also be used as a power-line filter installed in the wall of a shielded enclosure or equipment cabinet. The capacitor provides adequate insertion loss without suffering the power current saturation limitation of conventional filters which employ toroidal inductors. Solar feed-thru capacitors are highly reliable and ruggedly constructed units for general use in screen rooms and other environments. The metal case with four husky threaded inserts lends itself to convenient installation with minimal effort. The threaded feed-thru stud will accommodate power current of the listed rating without heating or voltage loss. 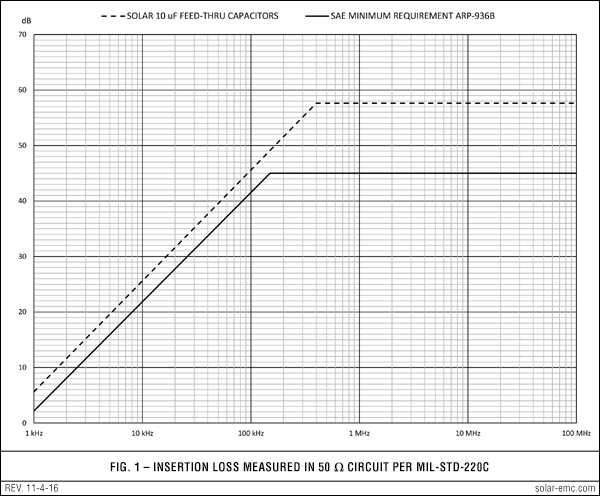 Table 2 indicates available current and voltage ratings of the various Solar 10 µF Feed-Thru Capacitors. All have low dissipation factors, high temperature ratings, high insulation resistance, doubly rated dielectric strength, and long life characteristics. To satisfy safety requirements, a bleeder resistor is included within the capacitors, which serves to discharge the capacitors when applied voltage is removed. *Discontinued, but refurbished units are available.